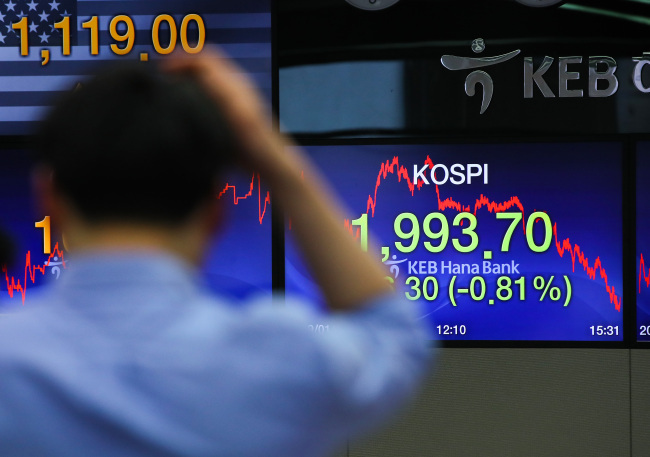 South Korea’s top-tier stock market Kospi closed below the 2,000 mark on Thursday, marking a two-year low, pulled down by foreign investors’ stock dumping and heightened fears of an economic slowdown, illustrated by Apple’s pessimistic revenue outlook. The main bourse index closed at 1,993.7, down 16.3 points, or 0.81 percent, from the previous session’s close. It had fluctuated above and below the 2,000 mark throughout the day, after its first dip under at 9:59 a.m.
Thursday’s figure marked the lowest closing price since Dec. 7, 2016, when the index was at 1,991.89. The tech-heavy secondary Kosdaq also tumbled to 657.02, which was 12.35 points, or 1.85 percent, lower than the previous close. Analysts said that US tech giant Apple’s decision to cut its outlook last night, citing poor sales in China, prompted a chain reaction. “Despite heightened expectations regarding the US-China trade war truce, Apple’s disappointing revenue outlook for the first quarter coupled with an economic slowdown in the world’s second-largest economy prompted a chain reaction -- which affected the Korean market,” said Seo Sang-young, an analyst at Kiwoom Securities. “It led to a decrease in foreign investors’ purchases in shares and an overall slump in the market -- the semiconductor industry and component manufacturers were dealt the hardest blows with their links to Apple,” he added. Samsung Electronics, one of the biggest chip providers of Apple, dropped 2.97 percent to 37,600 won, while SK hynix tumbled 4.79 percent to 57,700 won. The main bourse opened at 2,011.81, which was 1.81 points higher than the previous day’s close. But it sharply dipped below 2,000 within an hour, when the index hit 1,999.93 at 9:59 a.m. The last time the figure fell lower than 2,000 was on Oct. 30. The South Korean won traded at a two-week low of 1,127.7 won against the US dollar, weakening 8.7 won from the previous session’s close.